GitHub - karino2/kotlitex: katex porting for kotlin. Want to be notified of new releases in karino2/kotlitex? KotliTeX is KaTeX's Android port, written in Kotlin. This library provides com.karino2.kotlitex.view.MathExpressionSpan and com.karino2.kotlitex.view.MarkdownView. Currently we are porting KaTeX 0.10.0 and canvas-latex (which doesn't have releases) mostly as is, while merging the 2 parts may be technically possible. We believe that keeping the original structure makes future updates easier. We basically have two part in our library. Expression tree building and rendering it. Expression tree building is essentially the porting of KaTeX, while rendering is similar to canavs-latex (though this is sometime not the direct porting because of difference between HTML5 canvas and Android). mathcal PR is typical and good starting point for investigate. Use ktlint. ./gradlew format format all .kt files with ktlint. MathExpression Span now render inside TextView. We provide MarkdownView class, which parse math expression of jekyll style asynchronously. (Though other markup is not yet supported). 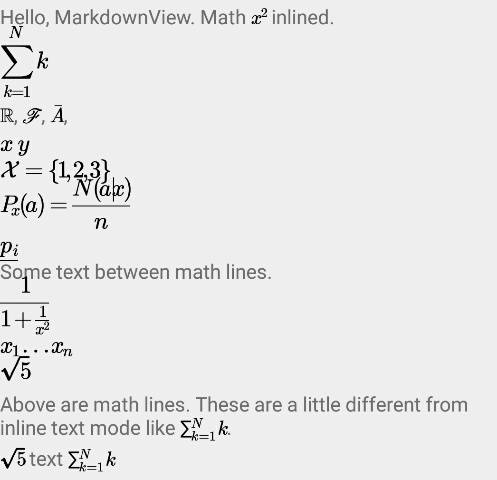 Then use io.github.karino2.kotlitex.view.MarkdownView and call setMarkdown(text) to render math expression. MainActivity.kt under sample directory show basic usage. kotlitex itself is under MIT license. Also, our library contains other libraries. This library contain KaTeX font, which is under MIT license. Some data table and comment is from KaTeX, which is under MIT license. For rendering part, though code is from scratch, logic is very similar to Canvas-Latex, which is under MIT license.